Property Size 2,200 sq. ft. 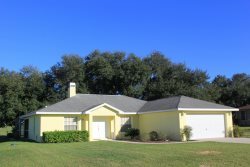 This is a spacious 3 bedroom and 3 bathroom house with a swimming pool that is located in the Inverness Villages a small neighborhood next to the Lakeside Country Club. This beautiful Vacation Villa comes with multiple upgrades and enough space for the entire family, come home to an open concept floor plan loaded with amenities inside and out. You will find that the living room is perfect for any family to relax and enjoy after a long day in the sun, the living room comes complete with a Flat screen TV, Internet access, and Cable TV. Adjacent to the Living room you will find the dining room which has seating for 6 guests. This Van Der Valk Vacation Home comes with a fully equipped kitchen which is perfect for entertaining whether a gourmet chef or just a home cook trying to put dinner on the table after a long day exploring Citrus County, this open concept kitchen has all you could need from pots and pans to upgrades such as appliances and amply countertops. This vacation rental is also the perfect place to relax and get a restful night’s sleep in one of the four bedrooms. The master bedroom is located at the east side of the living room and comes with a king sized bed dressed in luxurious bedding an en-suite bathroom and a flat screen TV. The next bedroom has 2 twin beds and the third bedroom also has 2 twin beds. This impressive home does not stop there; a vacation home is not complete without your very own screened in private pool for the entire family to enjoy. The Villages, next to the Lakeside Golf Community is a small subdivision close to Downtown Inverness. Next to the Withlacoochee State Trail and close to local groceries and shoppes. The front desk is located in the Van Der Valk Restaurant lobby. The Restaurant has a bar, patio and dining area for lunch, dinner or a snack. Ask for the restaurants’ season specials and business hours at check in. The pro shop of the golf -course is next to the restaurant facilities. Many restaurants, groceries, medical clinics, Wal-Mart, and a 24 hour pharmacy are within minutes of the Resort. There is no golf, sport and wellness membership with this home.